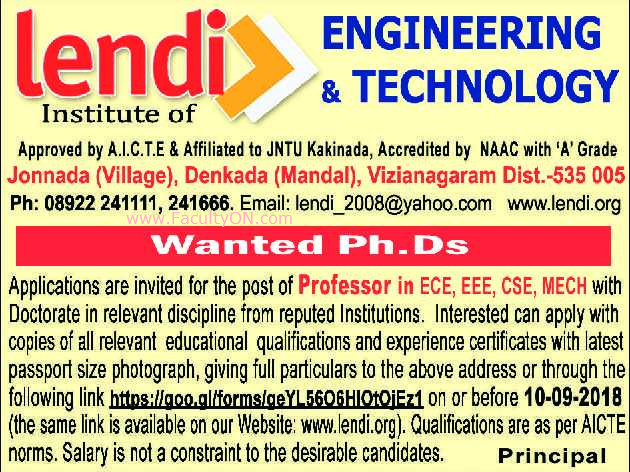 Lendi Institute of Engineering and Technology, Visakhapatnam has advertised in THE HINDU Opportunities newspaper for the recruitment of Professor jobs vacancies. Interested and eligible job aspirants are requested to apply on or before 10th September 2018. Check out further more details below. About College: Lendi Institute of Engineering and Technology a premiere Institution is established by a divine body of committed intelligentsia of Visakhapatnam to cater to the needs of young graduates of technology.Its aim is to create a unique scenario of eligible and elegant engineers to be brought out into the society to compete with and complete the realistic technological needs of India. Lendi is established under the aegis of SAI DHAMAM EDUCATIONAL TRUST, Visakhapatnam which is born with the sacred objective of providing educational opportunities to the ever increasing engineering aspirants.